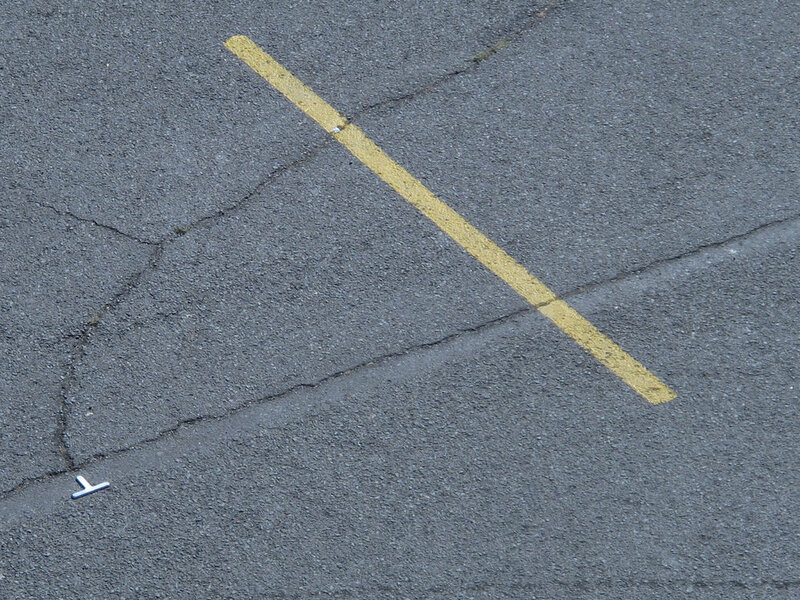 By following a set of symbols embedded in the pavement, observers can identify five types of fracture geometry that commonly occur in the asphalt paving of city streets and parking lots. An information column identifies the distinctive set of physical, geological, and technological forces associated with each pattern. Fractures parallel to the flow of traffic are usually caused by the compressive load of vehicles. Fractures running perpendicular to the roadway typically reflect forces more geological in character - earth movement, settling, uneven slopes and gradients. When pavement is stressed in multiple directions, it typically breaks into a triple junction, - a "Y" shaped set of three fractures joining at 120 degree angles . Rectangular or circular cuts in pavement for underground utilities often develop distinctive fractures called stress risers that radiate out from angled corners or curving perimeters.